Do you enjoy eating steamed dumplings? The original dim sum houses come from Guangzhou (romanised as Canton), the capital of the province of Guangdong, China. These houses were similar to American diners: small, simple establishments along the road which served tea and snacks for rural workers and travelers. Eventually, these tea snacks have become the main part of the meal and, in modern day China, dim sum has become a weekly ritual family meal, most commonly taken on Saturday or Sunday mornings. But, enough about the history and origin, you want to prepare it, right? To make tasty dim sum, you need a good recipe and a steamer and/or a steamer liner, thus today we’ll focus on choosing the best steamer liners and steamers for the tastiest dumplings ever. Steaming is an incredible way to cook veggies while retaining nutrients, especially because you don’t have to add fat nor grease. But, we’re here to talk about reheating foods which need moist heat: dumplings! With so many different kinds of steamers and steamer liners available, it’s rather difficult to choose the right one. So, let’s check each type to see if it fits. If you don’t want to buy a steamer (whatever the reason) or you’d like to cook foods that have a tendency to stick, such as dim sum, in your favorite wok, you can use a liner. Before silicone steamer liner have appeared, you had two options: one time use paper (non-reusable) or a reusable cloth that was difficult to clean. Not only does the silicone steamer liner help you cook your favorite meal appropriately, but it also makes cleaning up significantly easier. My personal favorite is Cuisine Wonders silicone steamer liner. 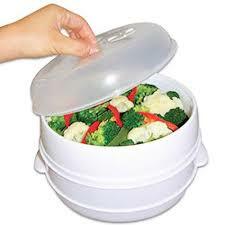 This product is designed to contract and/or expand so that it can fit into any pot size. Collapsible steamer baskets are great if you want to save on storage space and, most commonly, they are made of silicone or stainless steel. Both materials are good, although silicone ones are better for enamel and non-stick pot surfaces. Typically, these steamer baskets are made of stainless steel and they’re designed to fit over or inside a dedicated pot. 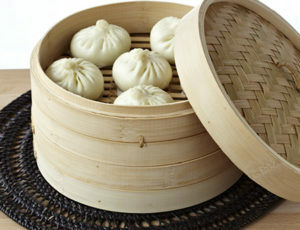 Its purpose is, of course, to hold dumpling (or other food) over boiling water to heat or cook. If it’s a removable basket, you can store it inside the dedicated pot. Bamboo steamers are traditional steamers in China and they fit inside a wok or large pot on the stove-top. With baskets fitting one on top of another, you can steam several tiers of food all at once. Apparently, these steamers are designed to be used in a microwave and they steam food very quickly. Microwave steamers hold food over boiling water and they vent steam. If you buy a multi-tied model, you’ll be able to steam several kinds of food simultaneously (in case your microwave oven is large enough, of course). For most people, electric steamers aren’t necessary kitchen equipment, but perhaps you’ll find them useful enough to invest some money in one. Basically, an electric steamer is designed to steam food(s) on the countertop, in a free-standing appliance. Most modern models have built-in timers for convenience and accuracy. Also, there are models with multiple compartments which you can program to suit exactly the type of food you’re steaming. Multi-cookers are very convenient kitchen products, because they’re designed for cooking food in numerous ways, including steaming. A countertop model is even more convenient because it frees up stove-top space. Just like electric steamers, multi cooker usually have built-in programmers and timers for convenience and accuracy. This steamer is reserved for high-end kitchen, since it is designed to fit into particular countertop space. Although it does look stunning, consider it only if you are going to steam foods on a daily basis.